Online video is the fastest growing advertising medium with over 8.3B video ads in March, according to comScore’s latest online video rankings. As inventory grows and online video advertising strategies mature, this trend should not only continue, but accelerate. As noted in eMarketer, Video Ad Performance measurement remains a challenge. Some advertisers use traditional TV metrics, such as Gross Rating Point, while others focus on click through rates or completion rates to measure performance. The challenge with each of these metrics is that it misses the larger goal of delivering (Return on Ad Spend (RoAS). Most other online advertising categories are performance based with a focus on delivering measurable incremental visits, conversions and revenue. We believe a smart video advertising strategy should incorporate RoAS as the primary metric to measure true financial impact, while ensuring that the video ads also deliver positive brand experience and engagement. This requires the ability to both report on these metrics and use a control-group approach to measure how much of this performance is incremental. There are many ways to measure performance of video advertising programs. Our belief is that RoAS measured via control group is the smart way to go. Is your video advertising program delivering measurable financial impact? SmartVideo delivers a compelling, personalized, real-time video experience designed to reach people with what they need to know in the most engaging, entertaining and informative way possible. SundaySky’s innovative convergence of technology and creativity has advanced the use of SmartVideo to more effectively engage people at every step of the customer lifecycle. Follow SundaySky on Twitter and Facebook. The do-it-yourself automotive trend is growing every day, and especially in a down economy, people want to save money by installing performance parts themselves so they can save hundreds of dollars on labor. There is no better way for a manufacture of performance parts to connect with their potential customers than to create videos such as the one below that give you a background and step by step installation guide so you feel comfortable doing the job yourself. For example, in the video below, Mishimoto, a brand popular for radiators and cooling parts, demonstrates how to install their parts into a Subaru Impreza WRX. It also helps that the video has a professional race car driver, Matt Waldin, to give credibility to the brand and entice customers to continue watching the video. The video goes step-by-step in explaining not only the benefits of the part, but what tools you need to do the job so you can be sure you have everything necessary to get the job done. Some customers like to make their own product videos, and they gain a following and recognition on automotive forums of their knowledge and experimentation of the products. Lots of times, especially with newer cars, people like to hold off on buying parts until someone in the community buys it first and then reviews it for quality, ease of installation and performance gains. Some how-to’s can get very technical, and some customers even do mechanical comparisons on a dynamometer to determine effectiveness of parts, such as a comparison of the difference between a short ram intake and a cold air intake. Information such as this isn’t so straight forward, so there needs to be testing done that can only be given credibility with a video posted online, or dyno sheets that show power gains. As customers get more savvy, online videos are going to be playing a bigger part in the automotive performance market. Companies want to prove that business video delivers a measurable financial impact to justify the investment. In the current online business environment, all companies need to invest in solutions that have a clear and measurable ROI and payback period. Sure, vendors of business video solutions tout the impact of video on targeted business metrics, such as conversion rate, churn rate, engagement rate, call rate, and customer satisfaction as drivers of ROI. But, do they prove that business video is actually delivering these results? If vendors only compare the metrics of video viewers to non-viewers, without controlling for volume of video views and the effects of self-selection bias, the actual ROI results will be inaccurate. True SmartVideo solutions are designed to address these concerns. Every program starts with defined goals that are measurable. The initial phase of the program includes a persistent control group that separates visitors into a test group (has access to video) and control group (no access to video). Performance of the video group vs. the control group is measured for each metric. This addresses the volume of video views on the total performance and also controls for self-selection bias. The aim is to measure transactional impact (short term) and lifetime impact (longer term) on key metrics. I’ll use an example to illustrate these points. A common statement is that “video-viewers convert at 3x the rate of non-viewers”. If non-viewers convert at 2%, this means that video viewers convert at 6%. Without using a control group to address video view rate and self-selection bias, the ROI projections would not be accurate or realistic. Consider the below visual. This illustration demonstrates the impact of self-selection bias on the test visitors who don’t view video (slightly lower conversion rate) and also reflects the impact of scale of visitors who choose to view the video. Although video viewers convert at 3X non-viewers, the actual lift in conversion is 5% when comparing total video group vs. control group (2.1% conversion rate for the video group vs. 2.0% for the control group). To effectively measure impact of business video, it is critical to define the success criteria and metrics before kicking off the program. Then, establish a control group to measure the overall effect of video on the target metrics, instead of measuring only actions of video viewers vs. non-viewers. Is your business video program delivering measurable financial impact? If not, consider adopting a SmartVideo approach. SmartVideo delivers a compelling, personalized, real-time video experience designed to reach people with what they need to know in the most engaging, entertaining and informative way possible. SundaySky’s innovative convergence of technology and creativity has advanced the use of SmartVideo to more effectively engage people at every step of the customer lifecycle. Our platform generates hundreds of thousands of SmartVideos daily that attract traffic, retarget prospects, convert prospects to customers, support customers and enhance customer relationships. SundaySky SmartVideo users include leading consumer-facing organizations like AT&T, Office Depot and Tiger Direct. Follow SundaySky on Twitter and Facebook. The “Godfather of Grunge” wants to clean up the sound of your music downloads. 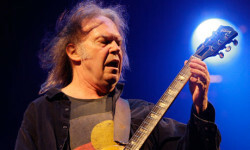 Neil Young, the legendary rock guitarist whose career has spanned over 45 years, is cranking out patents and inventions like a modern-day Ben Franklin. He recently converted his 1959 Lincoln Continental into an electrical hybrid car, and now he’s trying to revolutionize digital audio and video for the Internet. He is trademarking a revolutionary new high-definition (HD) audio format that he hopes will replace the popular MP3 music file format. He has also submitted patent requests for a corresponding HD audio and video player for his new music file format, plus a cloud-based online music store. The MP3 music file format has seen some cool innovations in recent years, like the ability to convert video to MP3 audio files. Still, an MP3 is a compressed file wherein CODECs are used to eliminate much of the sound file’s data. While this makes the file easier to download, some audio quality is lost in the trade-off. This trademark application also details features like “high-resolution discs featuring music and video” and “audio and video recording storage.” Clearly there will be a video component, and a corresponding online video player is specifically mentioned in the application. The “21st Century Record Player” might likely be equipped with a video screen, as iPods have conditioned today’s listeners to expect the ability to upload and play video files on a music device. The filings indicate that Young’s proposed online music store would be primarily cloud- based. Live video recordings of concert performances might be one of the more novel features included in this suite of products. It’s been reported that album sales have dropped by half over the last ten years; concert ticket sales during this period have more than doubled. It is clear listeners have a growing interest in live music, and Neil Young’s online music project may deliver high-resolution concert footage tailored to satisfy this interest. What Young’s audio and video plans are won’t be clear until the trademarks are registered and made public late this year. If his vision for high-resolution audio and video can be implemented and easily distributed, then digital music can “keep on rockin’ in the free world” with sound quality every bit as good as what the musicians and engineers hear in the recording studio. This article was written by Joe Kukura, a writer for the RealPlayer video technology blog who writes about streaming video news. I'm Larry Kless, President and Founder of Online Video Publishing [dot] com and this blog is a resource for sharing strategies, best practices, tips and how to's for online video publishers. Guest authors and advertising inquires are welcome, contact me at klessblog@gmail.com or (925) 858-3997 for more information and submission guidelines.